· Location data - In some applications, we offer location-enabled services and products. If you use those services or products, Trail Guide South Africa may receive information about your actual location or information that can be used to approximate a location. · Crash and usage data - If you use our applications, we may receive anonymous crash and usage data of your device. · Provide, maintain, protect, and improve our services and develop new services. 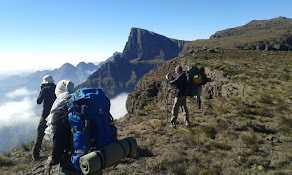 · Protect the rights or property of Trail Guide South Africa or our users. Trail Guide South Africa processes personal information on our hosting servers in South Africa and in other countries. In some cases, we process personal information outside your own country. · We have your consent. We require opt-in consent for the sharing of any sensitive personal information. · We have a good faith belief that access, use, preservation or disclosure of such information is reasonably necessary to (a) satisfy any applicable law, regulation, legal process or enforceable governmental request, (b) enforce applicable Terms of Service, including investigation of potential violations thereof, (c) detect, prevent, or otherwise address fraud, security or technical issues, or (d) protect against harm to the rights, property or safety of Trail Guide South Africa, its users or the public as required or permitted by law. We restrict access to personal information to employees, contractors and agents who need to know that information in order to process it on our behalf. These individuals are bound by confidentiality obligations and may be subject to discipline, including termination and criminal prosecution, if they fail to meet these obligations. We do not take legal responsibility in case external hacking leak the information however we make full effort to secure your information on all level. Ads company such Google and Facebook will use basic device information for advertisement support need.